From secluded bays to wildlife hot spots, we bring you part 1 of our collection of best beach camps in Tasmania. 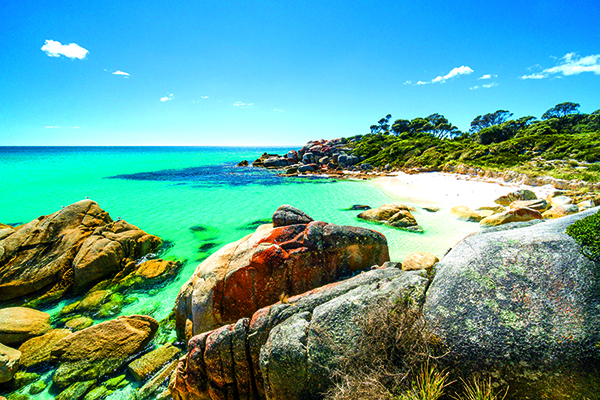 Tasmania’s tri-coloured coastline is full of dramatic seascapes, but it’s the wildlife encounters, rainforest walks and all those exquisite beachfront camps that inspire travellers to pop across for summertime fun. Where else but Tassie could you park your camper just metres from the sea and spend time watching little penguins amble ashore, sea birds nest and echidnas, wallabies and wombats forage close to camp. 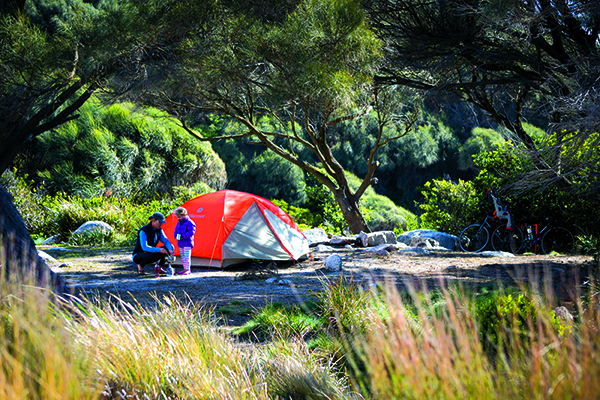 So clear your holiday schedule, as we bring you part 1 of our top beach camps in Tassie. The secret curl of sand that arcs around shimmering Sloop Reef is easily one of Tassie’s best and tiniest beaches, guarded by great granite slabs to warm up on after chilly dips in the bright blue sea. The compact camps above the cove are perfect for camper trailers and you can rockhop around the headland to stretch your legs. Fishing, frolicking and beachcombing will be your primary activities along the seemingly endless Taylors Beach. 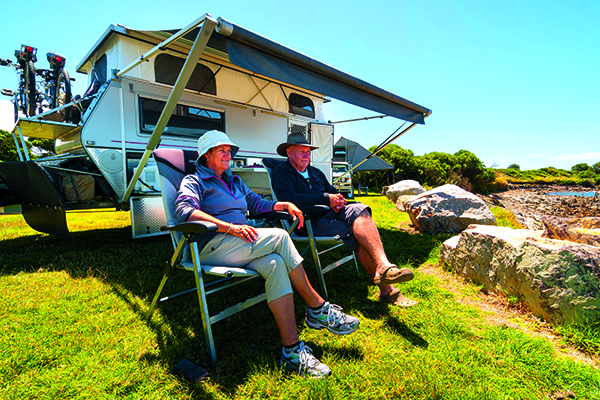 Sloop Reef is one of eight picturesque campgrounds in Bay of Fires Conservation Area that permit free, month-long stays on tranquil lagoons, wild, sunny beaches and atop weathered granite headlands. You need to bring drinking water and a portable toilet to some of the camps (Sloop Reef included), but St Helens is just 10km away for supply runs and there is plenty to do. Launch a boat on Grants Lagoon, paddle your kayak through great flocks of waterbirds at Big Lagoon, head to Swimcart Beach for its famously good surf fishing, or tackle the scenic, gravel Fire Road to Policeman’s Point on the conservation park’s northern edge. During summer when darkness falls over this little penguin rookery on Tassie’s northwest coast, chicks peep noisily from their nests and parents answer their calls, tumbling and stumbling out of the surf with bellies full of fish to share. The penguins’ nocturnal nighttime commute is a magical experience and oh-so-accessible because you can park your camper trailer on the grassy headland at Hall Point and overnight for free. There are no facilities on offer except a couple of picnic tables, but with long stretches of white sand beach to explore during daylight hours, this unassuming free camp is ideal for self-contained camper trailers. The best time to visit is from November to March and if you go, it’s important to remain as unobtrusive as possible. Find a spot away from the burrows and settle in before the penguins appear. Wear dark clothing, keep quiet and still, and use a red light torch (or cover your torch with red cellophane) and refrain from shining it on the penguins until they are safely on the beach or they are likely to return to the sea and leave their chicks hungry. If you’ve got grommets to exercise and surfboards strapped to your roof, make a beeline for Tassie’s Surf City, host of the West Coast Classic and renown for its good breaks and sometimes challenging swells. Marrawah is an intriguing spot, made infamous as the place where the last Tasmanian tiger was captured. It’s also home to some of Tassie’s most important Aboriginal art sites. These 2000-year-old rock engravings adorn about 40 rock slabs at Sundown Point, 3km south of the Arthur River mouth, and those found on the coast 3km west of Mount Cameron West are said to be the finest in the state. 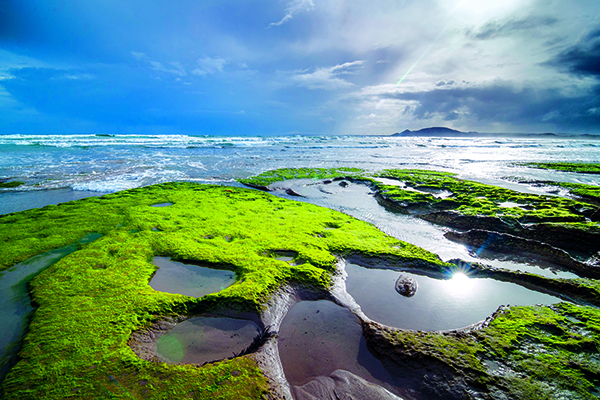 Marrawah cops some wild weather, but this windswept coastal landscape of rocky headlands and sculpted sand dunes makes a remarkable starting point for explorations into Arthur-Pieman Conservation Area and the scenic drive south to Corinna, Queenstown and Strahan. While in Marrawah, the free beachfront camping area at Greens Point is basically a big car park but provides toilets, a cold-water shower, drinking water, bins and a picnic shelter with free gas barbecues and tables. While world-famous Wineglass Bay is a magnet for travellers by day, the gorgeous strip of sea-ravaged headlands and white silica sands at Friendly Beaches is where campers spend their nights. 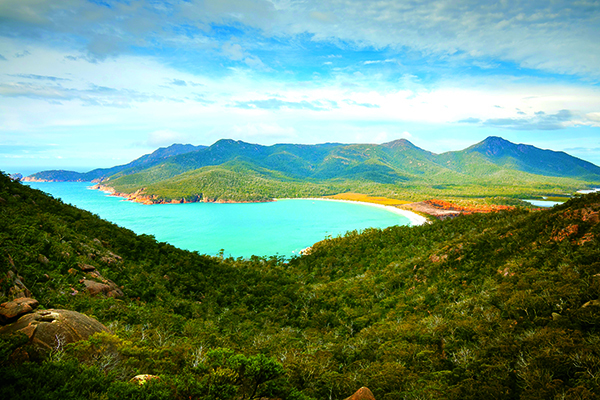 Both destinations lie within Freycinet National Park, home to some of the East Coast’s most alluring landscapes, and the Friendly Beaches’ stellar camp at Issac Point. Here you’ll find sheltered sites tucked amongst the coastal heath; cosy nooks for tents and open ground for big family set-ups. There’s a top beach break for hardy surfers and you can poke around the tessellated rock pavements at low tide spotting colourful cowrie shells and sea stars. The sunsets are champagne-worthy and after dark, wombats, pademelons and Bennetts wallabies forage around the camp.